The animation world has been abuzz since animation legends Don Bluth and Gary Goldman announced they were doing a crowdfunding campaign for a sizzle reel for Dragon’s Lair: The Movie. The duo first started on Kickstarter, but recently moved over to Indiegogo last week. In less than a week, the new Indiegogo campaign has amassed over $200K, reaching 80% of its $240K goal. However, they don’t want to stop at $250K, they have a lot of awesome stretch goals, contests, giveaways and more sneak peek’s for backers in the the coming weeks. The Rotoscopers had the opportunity to sit down with Don and Gary to discuss the campaign and film. 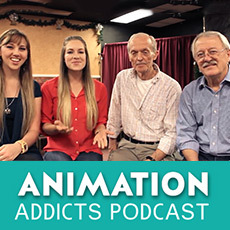 Check it out in the newest episode of the Animation Addicts Podcast! A little bit about Dragon’s Lair‘s history and cult status. Why they made the jump from Kickstarter to Indiegogo. A little tease at the plot: it’s a prequel! We all wish Walt Disney happy birthday…in harmony! What they’re going to do with the money from the campaign.